← What is “sleep myoclonus”? Is it normal for children to have “bow legs”? 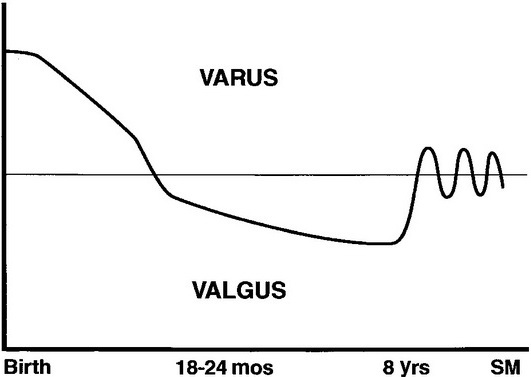 Take a look at this graph that shows you that children tend to have slightly bowed legs (“varus” in medical terminology) when they start to walk which should straighten up around the age of 2 and may then “overshoot” into knock-knees (“valgus”) for a couple of years which then settle down into whatever sort of position is common in their family by about 8 years. Children who walk early (before their first birthday) may have bowing of their legs up to the slightly later age of 3 but you should seek medical advice if your child’s leg bowing goes on longer than that or if only one side is affected or if their legs are painful. There is some nice parent information on common childhood orthopaedic problems at http://kidshealth.org/parent/medical/bones/common_ortho.html. Many children in north London are vitamin D deficient and not taking the daily multivitamins that the Department of Health advises they should. Severe vitamin D deficiency can lead to rickets in the under 3s which needs high doses of vitamin D under the care of a doctor to rectify as it is not only the bones that are affected when things get this severe. 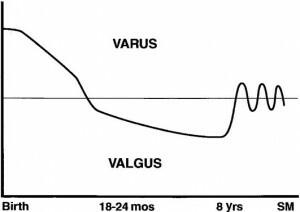 Take your child to see your doctor if their wrists and knees are swollen, they are not growing properly, seem to be reluctant to walk, have bow-legs and seem generally miserable. There is good parent information on rickets at http://www.patient.co.uk/health/Rickets.htm. This entry was posted in children's health and tagged child development, growth issues, nutrition. Bookmark the permalink.